Does Jakarta Need a 111-Story Tower? There is certainly a lot happening in Indonesia. The Southeast Asian nation has bounced back from the 1997 Asian financial crisis and is, for the first time in decades, on sound financial footing. The Indonesian economy is turning heads at a time when most developed economies are trying to turn the corner. The country has seen an average annual GDP growth rate of 5.2% from 2001 to ’08, and it is expected to expand more than 6% this year. Earlier this year, its sovereign-debt status was bumped up to investment grade by two of the major ratings agencies — a third is likely to follow suit. “We expect growth to pick up in the coming years to about 7% over the medium term,” said Stephen Schwartz, BBVA Research’s chief economist for Asia. 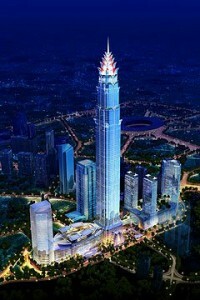 The developers hope the tower will be a symbol of Indonesian ascendancy, a testament to the country’s towering ambitions. But not everyone is sold — on Indonesia’s prospects, or on the project itself. As a recent report co-authored by the Asian Development Bank (ADB) points out, Indonesia’s economy is still relatively fragile. If growth stays at current levels, Indonesia would need 23 years to reach the per capita income level that neighboring Thailand achieved in 2008. The report warns that Indonesia risks succumbing to the “middle-income trap” wherein inadequate infrastructure, weak institutions and economic inequality dampen growth. “Stronger institutions are key in pushing forward harder reforms, such as reducing badly targeted fuel subsidies, which are needed to accelerate more productive investments in infrastructure development and initiatives to reduce inequality,” says Jon Lindborg, ADB country director for Indonesia. For now the developers, like the country, are pressing ahead. They hope to break ground by year’s end.